For all of the many things I’m grateful to my parents for, kindness ranks at the top of the list. I have random memories of my mom helping an overloaded mother carrying too many groceries in the parking lot by taking a few bags off her hands; my father picking up a fallen plane ticket for the man in front of us while waiting in the airport security line; both my parents graciously taking in a homeless cat for a week at my request as a child, despite not liking cats at all (much to the dismay of our golden retriever). Our actions speak louder than our words, and the behaviors we model (whether intentionally or not) have a very real impact on the children around us. At a wedding reception a couple months ago, in mid-conversation with friends I noticed a grandmother holding two canes in one hand while trying to balance a plate of food in the other as she made her way toward her seat on the other side of the room. I excused myself, went over and asked if she would like me to carry something for her. She was extremely grateful, and handed me the plate of food. To be honest I didn’t give it another thought, and afterwards was swept away by the crowds of new family I was meeting. I did not see her again for hours. At the end of the reception, just as I was leaving, I was summoned to take a last-minute picture. I was guided to a table and found that it was my grandmother friend who had summoned me; she wanted to remember my face. I blushed as she told her family how no one else had even noticed her struggling to walk with two canes and a plate of food, and that she would remember me for my kindness. Small acts of kindness make a difference in ways we cannot imagine or foresee; my offer of help came from who-knows how many times I’d seen kindness modeled for me growing up, including all the many times people showed kindness to me. It was instinctual, automatic. Among many others, I have my parents to thank for this. I am not just myself, alone and discrete – I’m an accumulation of countless experiences and influences; in fact, the influence that got me thinking about all of this in the first place is a blog post by one of my Zen teachers, Melissa Blacker. It’s called Bodhisattvas Arising From the Cracks in the Earth. So thank you for every kindness you show. Small actions can touch the lives of many, often without our realizing it. 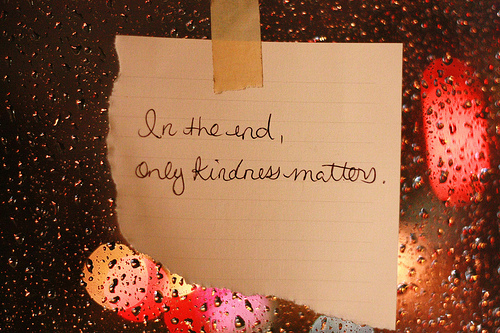 What kindness have you seen or participated in today? What an amazing gift your parents gave you! I love that being kind is automatic for you. It is a beautiful thing to do something n g kind and then see your child imitate you in the future. Happy to have found you! I really appreciate your comments, keep them coming! There’s a lot to be said for modeling the behaviors you want to see in your children. Kids are monkey-see monkey-do creatures, and they internalize many values/behaviors based on what they see the adults they care about most do. My childhood was no bunch of roses, but I absorbed some very important values from my parents that I’m deeply grateful for. As the adult, the trick is taking the long-view of your child’s development; especially during the early years, you’re planting many seeds. Who can say what will take root & flourish – patience is definitely required!